Principal Mrs. Jeanie Aibara is an educationist, leader and visionary. 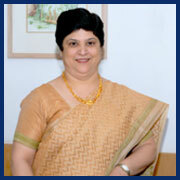 She brings three decades of valuable academic expertise, eighteen of which were at India's premier institute- Delhi Public School R K Puram, New Delhi. A post graduate in English Literature and bachelor's in Education Mrs. Aibara is a proud recipient of the State Teacher Award by the Federation of Public schools, New Delhi. Under her transformative leadership Ambience Public School continues to grow in academics, sports and extracurricular activities. In keeping with the needs of the 21 st century, Mrs. Aibara supports learning in a safe environment, promotes media and technology literacy in classroom, and is focused on producing creative and innovative thinkers for global competition. For her, schooling is an ethical endeavour and a labour of love. According to her teaching is not just imparting knowledge to expectant students; teaching involves nurturing every child and being responsible for the social, emotional and physical well being of each child at every single moment of the school day. A passionate believer in holistic and lifelong learning, Mrs Aibara's philosophy is based on inclusive education for all children. "As human beings, our greatness lies not so much in being able to remake the world- that is the myth of the atomic age- it is being able to remake ourselves."